RakeTheRake Android app is live! Yep, RakeTheRake now has an application to work on Android phones. The app called Poker Agenda has been developed by NobleDroid and has been bringing poker players information about all the PokerStars tourneys for some time now. However its recent upgrades have developed it further to deliver tourney and room info from Party Poker, Carbon Poker and Aced Poker amongst others, with more rooms still to be added. It has also taken feeds from RakeTheRake.com to provide our tourney (tourney tab), freeroll and rake race schedules (rakeback tab), the best rakeback deals (bonuses tab) that we provide, as well as our news feed (news tab). Poker Agenda is a brilliant way of keeping up to date with what’s happening at your favourite rooms, and shows which events you can register for now, even when you’re away from your PC. Especially as it enables you to set reminders for upcoming events that you want to play in. Do note though that the app is not for playing poker, it’s for the information from the rooms and from RakeTheRake. All the info you need to know is there, from buy-ins, dates, start times to guaranteed prize pools and of course, the very best rakeback deals and rakeback promotions. 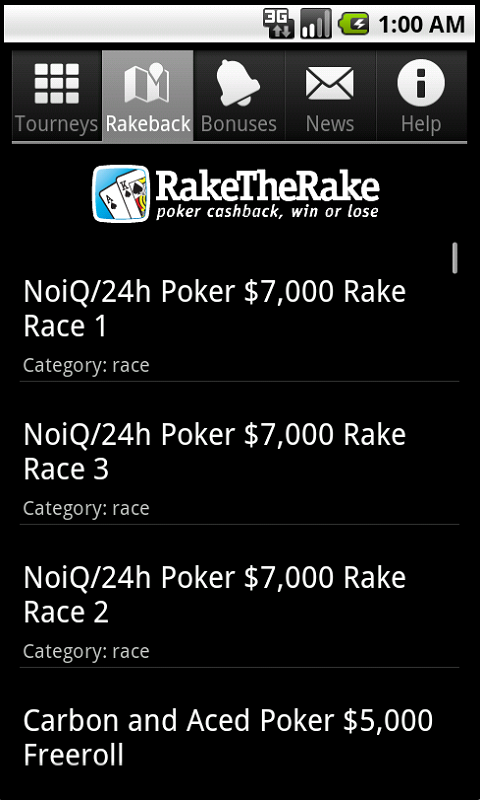 Home » Rakeback News » RakeTheRake Android app is live!